Another day off from work means sleeping in and eating before the workout. First though, I rolled out of bed and my glutes were killing me like never before. Makes sense because I have never done 150 lunges before either. I took a little longer than usual to get started. Was enjoying my time with wife and daughter, so I didn’t even begin my workout until 11:00 a.m. I really wanted a hard workout today, so I chose Insanity Asylum’s Gameday and Overtime workouts. I don’t really know how to describe that succinctly in a blog, but you can see my video review of it here. It really is a tough all-around heart-pumping, high-intensity workout. The hardest part of the day was the additional Overtime workout. It is extremely brutal, especially after having completed an hour of Gameday. The review of Asylum Overtime can be found here. After gulping down a recovery drink, I had one more thing to do. 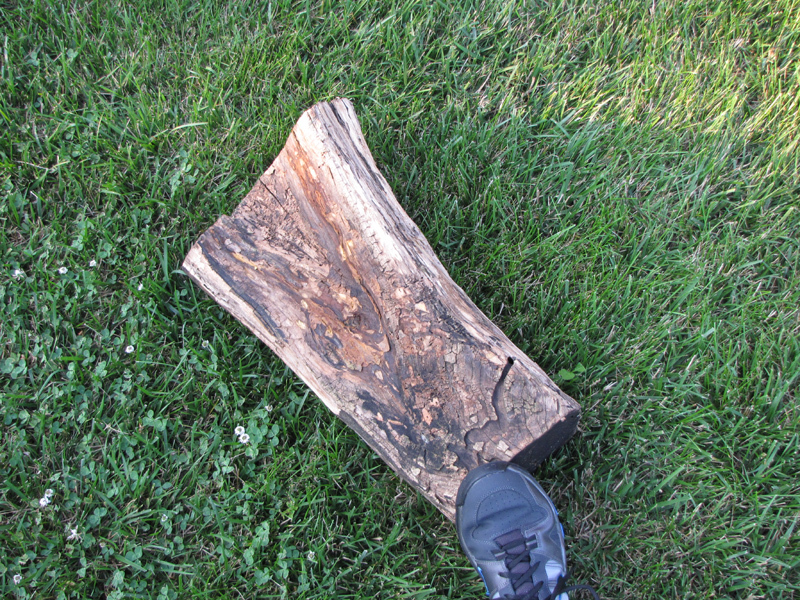 I had been toying with the idea of adding another obstacle to some of my running routines and decided that obstacle was going to be a log. I put on a pair of pants and work shoes, grabbed my axe and headed down to my woods to find the right one. First thing that I realized is that with my emphasis on fitness this summer, I had let the weeds and brush take over a big portion of the areas that I had previously cleared. I bushwhacked my way to a spot where I knew there to be fallen trees and found the perfect one to start hacking on. It took me about 20 seconds to realize that this selection wouldn’t work. After the bark chipped away I discovered the entire tree was inhabited by ants. On to find another one. I remembered where another fallen tree was an made my way across the hillside to it. This one was smaller in diameter and I didn’t like it as much, but I thought I could just cut a longer piece to compensate. My stance was a little precarious so as soon as I cut it away from the rest of the log, I dragged it aside and was going to toss up the hill to a clearing….. Bad toss. It hit a rock or something, bounced at an angle, and continued to bounce until it was way down in the gulley. I didn’t like it anyways, so I shrugged and starting cutting away at another one. This time I carried it to the clearing. It was decent, so I chipped away at the bark. All of a sudden a small hole appeared in the wood and guess what? Yep. More ants came streaming out. That one was out. By this time, the sweat was pouring down my face, I was itching, and thirsty. I had one last place to look. A couple of autumns ago, I had cleared out an area adjacent to my yard and cut up a really tough old stump. That wood was so gnarly and hard that it gave my chainsaw fits. I poked around under the honeysuckles until I found a piece of it. Jackpot! The right size, heavy, and no appearance of ants. I hauled it up to the yard and chipped away at the bark and dirt. Still no ants! Hallelujuah. I carried it up to my backporch, sprayed it down with the water hose, and let it set in the sun to bake. Next the hard part comes when I start carrying it around.